A Rock And Roll Event! 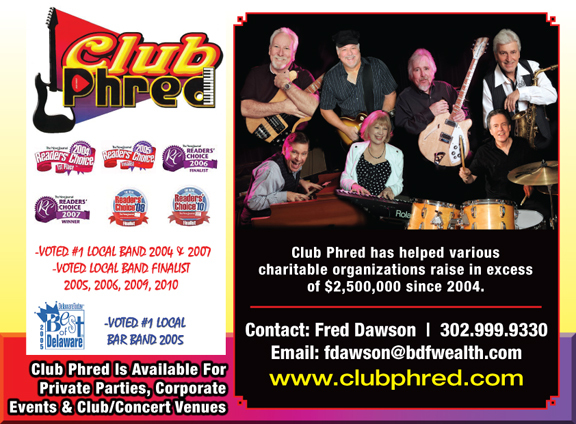 Club Phred is a group of musicians who on average have over thirty years of professional experience. We all share a love of classic 60’s and 70’s music and have deep roots in the Delaware, Pennsylvania, and New Jersey tri-state area. Club Phred formed in 2002 and has performed with the likes of Mark Farner Formerly of Grand Funk Railroad and opened up for Pete Best the original drummer of “The Beatles” and The Marshall Tucker Band. Club Phred has won numerous awards from the Delaware media.